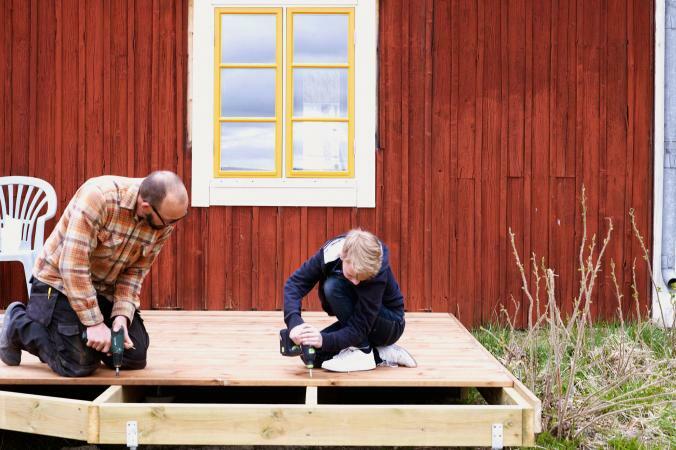 Building your own deck is a great way to spruce up your house. A deck is a wonderful addition to any home and makes a great place for family and friends to gather and hang out. If you have a carpenter's itch and want a place to enjoy the outdoors, try this project. When you build your own deck, safety should always come first. Wear goggles to keep splinters and sawdust from getting in the eyes and make sure that all power tools have proper safeties. Determine the design that you want to use. A set of plans can be very helpful and easily found online, in home improvement stores, and even in books on do-it-yourself projects. Prepare the ground where the deck will go by first removing all of the sod. You will need to level the ground by adding in fill dirt. Slope the ground away from the deck area and the house to make sure it will drain properly. The deck will need to be attached to the house by adding a ledger. This is usually a 2x6 attached to the side of the house using a drill and lag bolts. You can use the level and a chalk line to make sure the ledger is level. Depending on the size of the deck, you could also use either a 2x8 or a 2x10 board. Install temporary batter boards along the ground to determine the size of the deck and the placement of the posts. Use a shovel to dig a hole for each post. The hole should be wide enough for the concrete pad and deep enough to extend below the frost line. Mix the concrete, pour into the holes, and wait for it to set. When the concrete is dry, place the concrete pad on top and attach your 4x4 post using post anchors. Use a level and a string to adjust the height of the posts and batter boards to temporarily hold them in place. Beams are the 2x10 boards that the joists will set on. To install, run the beams from post to post and attach using post-to-beam connectors nailed or screwed to the tops of the posts. The joists are set crossways on top of the beams and are what the decking boards are nailed to. Joists are commonly 2x6 boards set 16 or 24 inches apart. Joists are attached to the beams using screws or metal connectors. Once the joists are set, it is time to add the decking. Deck boards are usually 2 inches thick and made from redwood, cedar, or pine. Screw the deck boards into the joists using galvanized deck screws. Make sure both ends of the board sit on top of a joist and leave a space of about 1/8th an inch between the boards. You can accomplish this by adding a spacer between them as they are screwed into place. Once the deck is in place, you can add the railing. Attach rail posts to the outside edge of the deck and run all the way to the ground or screw directly into a plate on the deck itself. Once the rail posts are in place, attach the rails using a level to make sure they are plumb. Finally, quality outdoor deck stain or porch paint can be applied to the deck along with a water sealer. The sealer, when applied regularly, will ensure that the deck lasts a long time.